Deleuze, Gilles, and Félix Guattari. “Introduction: Rhizome.” Transatlantic Literary Studies (2007): 226-31. Essay and General Literature Index (H.W. Wilson). In the introduction to the text, Deleuze and Guattari challenge the notion of the tree as a metaphor for the way in which things exist within relationship with each other. It seems that the tree is problematic because when used as a metaphor, the tree must be replicated. The organization or design of the tree is traced in constructing an understanding of the object being studied. Looking at the object as a rhizome allows one to map the organization of the object because it does not attempt to dictate the shape of the object of study. According to Deleuze and Guattari, a rhizome has no beginning or end; rather, it is the in-between. Rhizomes overcome the problems associated with attempts to use linguistics to understand connections between language and statements (7). The rhizome endlessly creates connections (7). Rhizomes are characterized by multiplicity, which has no object or subject, but determinations, magnitudes, and dimensions (8). Rhizomes allow for increasing of territory being examined through deterritorialization (11). Because of the possible multiplicities of the rhizome and the multiple entrances and exits, it is possible that the root-tree exists within the rhizome (14). The brain is a rhizome. The rhizome is acentered. It is able to connect a point to any other point, and it is composed of dimensions or directions in motion (21). In the above video, John David Ebert says that Deleuze and Guattari craft an anti-philosophy to challenge all philosophies that have linear argumentation. What about Foucault, and how does this relate to Foucault? Well, it seems to me that the concept of the rhizome is a direct challenge to the concept of the “tree of enunciative derivation”. Foucault’s tree of enunciative derivation starts with a base made of the statements that contain the rules of formation of the tree, with statements also at the summit. This concept is challenged by Deleuze and Guttari because the rhizome does not plot a point or fix an order as the tree metaphor does (7). According to Deleuze and Guattari, the “rhizome ceaselessly establishes connections between semiotic chains, organizations of power, and circumstances relative to the arts, sciences, and social struggles” (7). My interpretation is that rather than being guided by statements that form hard and fast rules for the formation, but that the relationship between the rhizome and the language is fluid. Foucault’s tree of enunciative derivation for me was a seemed to be a revelation when I read it, and now I can see the ways in which the theory was problematic when I applied it to LLLI in my first case study. In that case study I discussed the organizations core philosophies as statements that formed the tree of the organization, but the theory had gaps that could not account for the fluid way in which the organization dealt with problems that arose as new members joined and the organization was forced to re-envision what their statements meant and what statements that members of the organization and others made challenged the practices of the organization and required a new unity to operate as a organization. As Deleuze and Guattari say, “unity is consistently thwarted and obstructed in the object, while a new type of unity triumphs” (6). 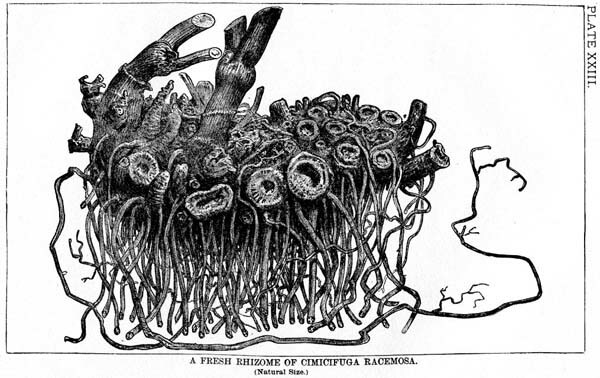 What the heck is a rhizome anyway? 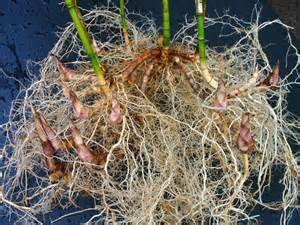 The rhizome of a bamboo plant. These images were very useful in helping me understand the difference between a tree and a rhizome. A tree can only grow in one direction with one trunk, while rhizomes can result in a number of growths originating in the same space. It seems that what the rhizome physical offers is the deterritorialization that Deleuze and Guattari discuss. They say, “you start by delimiting a first line consisting of circles of convergence around successive singularities: then you see whether inside that line new circles of convergence establish themselves, with new points located outside the limits and in other directions” (11). These rhizomes seem to be doing just that. “Many people have a tree growing in their heads, but the brain itself is much more grass than a tree” (15). While this quote is referencing the actual physical organization of the brain and the two kinds of memory, this harkens back to the concept of the ecology of the mind. Bateson’s Ecology of the mind challenged the concept of the individual mind. The concept of the individual mind ignores the environment of the individual. Bateson claims that there is a need to revise our thinking about mental/communication processes because the mind (internal pathway) is different than the cause and effect system of sciences (external pathway). The idea of the mind as a rhizome is compatible with Bateson’s view that the identity of the mind is bound with the social forces which surround it. Scott, John. Social Network Analysis : A Handbook. London; Newbury Park, Calif.: SAGE Publications, 1991. “Lewin’s early work on group behavior was published in a book that outlined his view that group was seen as determined by the field of social forces in which the group was located (Lewin 1936). A social group, he argued, exists in a field: a social ‘space’ that comprises the group together with its surroundings and environment” (11). Well, well, well… if it isn’t a rhizome. Here I see connections with Deleuze and Guattari, as well as with ecology and Castells’ space of flows. The idea that group behavior is determined socially is very reminiscent of the distributed mind we talk about in ecology. Scott goes on to say what matters here is not the external characteristic of the environment, but what is perceived about the environment. While the environment may offer affordances, those within the environment may not see all affordances. They are aware of only the perceived affordances. (Though what they do not see still very much impacts them.) Also, fields are full of rhizomes, so what is being described here is reminiscent of the social organization impacted by rhizomes. Of course, we are also dealing with the concept of “space”. The environment is made up of “elements within a single field of relations” (11). Isn’t that the space of flows? “It is undoubtedly the case that social network analysis embodies a particular theoretical orientation toward the structure of the social world and that it is, therefore, linked with structural theories of action. But it seems unlikely that any one substantive theory should be regarded as embodying the essence of social network analysis” (Scott 37). Well, now I can finally stop questioning which theory is the RIGHT theory. It seems there is not RIGHT theory; instead, it seems that what counts is the method of analysis rather than the ONE theory. Rainie, Harrison, and Barry Wellman. Networked : The New Social Operating System. Cambridge, Mass: MIT Press, 2012.